One of the alluring traits of a nylon-string guitar is the way its tonal character can instantly change the complexion of any song. This makes a nylon an indispensible tool for songwriting, recording and performance, letting you weave a different flavor or rhythmic texture into your music. 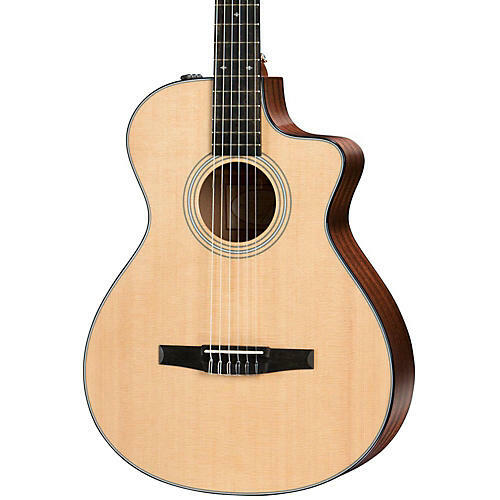 Taylor nylons achieve the same exceptional playability as their steel-string siblings, offering a smooth crossover with a sleek profile neck, a 1-7/8 in. nut width (compared to a much wider traditional classical neck), and a slight radius (20 in. compared to 15 in. on Taylor steel-strings). With a Taylor nylon-string in your acoustic toolbox, like this 312ce-N Grand Concert Acoustic-Electric, you might be surprised by how often you end up reaching for it. Taylor's 300 Series has introduced countless players to the pleasures of the all-solid-wood acoustic experience; it's the entry point to Taylor's USA-made instrument line. Players who step up to a 300 Series instrument will be rewarded with a guitar-for-a-lifetime that will only sound better with age. It doesn't take but a few strums to learn how the mix of tonewoods, construction and appointments combine to make Taylor's famous playability, intonation and tone. The 300 Series has everything you need and nothing you don't need in a fantastic sounding and playing instrument. The 312ce-N is a Taylor Grand Concert which is slightly smaller than a Taylor Grand Auditorium and yields controlled overtones, so the sound won't occupy a lot of sonic space. This is often a key consideration when other instruments are in the mix, such as in a performance or recording environment, and it allows the guitar to be heard more clearly. Its intimate size makes it lap/couch-friendly, and a great fit for players who find smaller instruments more physically comfortable. A guitar's top is the primary filter and distributor of vibrating string energy through the guitar, which means it has a huge impact on its sound. The 312ce-N features solid Sitka spruce, the most prevalent guitar top wood of the modern era. It blends stiffness and elasticity in just the right proportions which translates into broad dynamic range with crisp articulation. Solid Sapele back and sides complement the top with a sound that's comparable to mahogany but with a slightly brighter sound featuring top-end shimmer, and balance across the tonal spectrum. Sapele responds well to a variety of playing styles and fits nicely into an instrument mix.